wires at the field's edge. The crowd of 500 thought they had witnessed a miracle. Thirty-three and one half-hours and 3.500 miles later he landed in Paris, the first to fly the Atlantic alone. 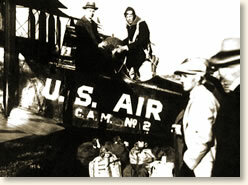 "About 7:40 A.M. the motor was started and at 7:52 I took off on the flight for Paris. The field was a little soft due to the rain during the night and the heavily loaded plane gathered speed very slowly. After passing the halfway mark, however, it was apparent that I would be able to clear the obstructions at the end. I passed over a tractor by about fifteen feet and a telephone line by about twenty, with a fair reserve of flying speed. I believe that the ship would have taken off from a hard field with at least five hundred pounds more weight. I turned slightly to the right to avoid some high trees on a hill directly ahead, but by the time I had gone a few hundred yards I had sufficient altitude to clear all obstructions and throttled the engine down to 1750 R.P.M. I took up a compass course at once and soon reached Long Island Sound where the Curtiss Oriole with its photographer, which had been escorting me, turned back." "Darkness set in about 8:15 and a thin, low fog formed over the sea through which the white bergs showed up with surprising clearness. This fog became thicker and increased in height until within two hours I was just skimming the top of storm clouds at about ten thousand feet. Even at this altitude there was a thick haze through which only the stars directly overhead could be seen. There was no moon and it was very dark. The tops of some of the storm clouds were several thousand feet above me and at one time, when I attempted to fly through one of the larger clouds, sleet started to collect on the plane and I was forced to turn around and get back into clear air immediately and then fly around any clouds which I could not get over." Lindbergh, Charles A, We, (1927); Lindbergh, Charles A, The Spirit of St. Louis (1953); Mosley, Leonard, Lindbergh (1976). Before making his transatlantic flight, Lindbergh flew the "Spirit of St. Louis" from its factory in San Diego to Long Island. Stopping only in St. Louis, he made the flight in 21 hours and 20 minutes - setting a new coast-to-coast record. 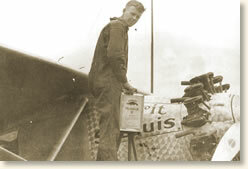 Lindbergh designed the "Spirit of St. Louis" without a front window. This provided more room for fuel but forced him to use the plane's side windows to view the world around him. This made for rather tricky takeoffs and landings. 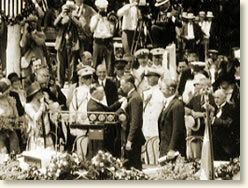 The "Spirit of Saint Louis was built in San Diego to Lindbergh's specifications for $10,585.